With the advent of Reliance JIO, the telecom market was confounded with the offers and data rates offered by the giant. The so-called BIG-FISH of the telecom industry, namely – Idea, Airtel and Vodafone were worried over the loss of customers in the light of super-attractive offers by JIO. And for the first time ever in the history of telecom evolution, people were standing in long queues for days and not hours just to procure a SIM Card that allowed them to talk for free and use the internet for free. In fact, the trend was of such an accord that the Demonetization Queues were being criticised but not the ones for the JIO SIM Cards. Well, the other telecom companies thought that this rush will be wiped off in a swift swap once the year ends; but JIO announced that the offer will be valid until March 31, 2017. With the end of the trial period approaching, JIO devised completely new offers for PAID services; but still are BETTER, CHEAPER and REALLY FETCHING as compared to the other post-paid and prepaid plans. 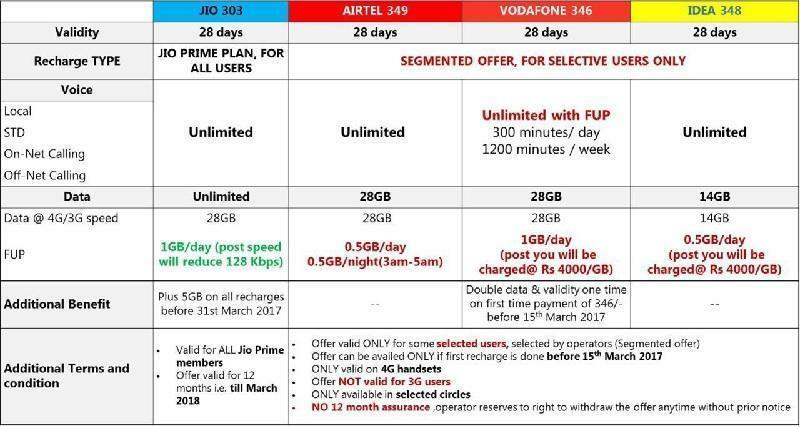 Though Airtel, Vodafone and Idea released new offers as well, but a comparison of all plans with the ones offered by JIO will speak for itself. The consumers were recharging their JIO numbers with PRIME offers when the news of IDEA and Vodafone merger hit the market which was another attempt at garnering the biggest consumer base. But still, the offers don't stand in comparison to Reliance JIO. Check out some cool Jio Prime plans and offers. With the data and services wars becoming harsher in the telecom industry, the consumers are in a win-win situation only as a few months ago, no one would have thought that so many services will be available at such low prices. When JIO announced the Prime Membership and Offers therein, the other giants – Airtel and Idea scrapped roaming and the incoming was made free for all of its customers. They tried to override the 303 JIO Plan by offering 349 and 348 plans respectively. Vodafone introduced the 346 plan to be in the race as well. A mere glance at the table and the consumers will be assured that the JIO plans are the BEST and the MOST BENEFICIAL. The catch in other plans being the SELECTED CUSTOMERS and lots of other terms and conditions that doesn't allow the user to enjoy the services fully. In fact, the users will be charged a whopping Rs 4000/GB if they surpass the monthly data limit again and again. Further it has been clearly mentioned in the terms and conditions of the other companies that the operator can withdraw the offer at any time without any prior notice and that the offer doesn't guarantee 12 months. After having compared the Pre-paid plans of various telecom companies, let us check the post-paid plans so as to find out whether JIO aces this as well or not. It was not long ago when JIO announced the Prime offer and other plans for the paid services and the customers that were thinking of throwing their JIO SIM Cards away are now recharging their SIM Cards for the scintillating offers. While the competition is still burning hot in the telecom industry, the prices of post-paid services have also been slashed and the consumers are being tricked by a manipulative re-structuring of the plans by Airtel, Idea, and Vodafone that is only creating segmentation in the consumer base. The biggest benefit of using JIO is that the user will get additional 5GB and 10GB data per month with the recharge values of Rs 303 and 499 respectively. if the recharge is done before March 31, 2017. No matter what plans the other companies come up with, this offer can NOT be beaten up at all. Though at first look the customer might get an illusion that all the plans of 499 have same services and data offers; but do some calculations and you can easily find that JIO will offer 720GB data while the others will offer 66GB or 51 GB. The users can easily find that no other operator provides 360 GB data for Rs 3636 in a year. Further, these plans come with a validity of 3 months and JIO maintains the YEARLY offer in the post-paid services as well. JIO will offer FREE calling services in every basic plan for all kinds of consumers. But the calling services are kind-of free in the Airtel 799 plan. The company has stealthily kept the rates SAME but just reduced the data made available to the consumers which ultimately means that the cost has been raised as much as 117 rupees per GB. What is ACTUALLY going on?? With the rates being slashed, services and data amount being increased and competition still becoming biting at every single second, the companies other than JIO have just SEGMENTED their consumers. They have targeted the premium members only and have sidelined the people that NEED the data. In this attempt of theirs, they have tried to make those customers happy that were already availing their services and are classified as the ARPU Customers. Idea Select Titanium, Idea Select Platinum, Idea Select Gold, and Idea Select Silver are the other 4 plans that have been launched and are being marketed. These plans will divide the users based on their monthly billings. The maximum benefits are being offered in the Idea Select Titanium which means that the elite are served the best. With the motto of making "Data a RIGHT and not a PRIVILEGE", JIO has not at all created any segmentation in the market and is actually working towards the Digitization of India. Come what may, the Telecom Companies in the market are not able to beat Reliance JIO offers and services that are being offered at such exciting prices and without any distinction between the users and their bills. Though the companies are marketing their new plans as the BEST, but this article will surely help all the users to understand BETTER. East or West – JIO is the BEST…!!! Reliance Jio's offers are more beneficial compared to other telecom companies offers. Airtel, Idea and Vodophone are struggling to keep pace with Reliance Jio. Prior to Reliance Jio entering the telecom sector subscribers were at the mercy of these companies and had to accept the unreliable and costly services from these companies. This competition will benefit subscribers in the long run.